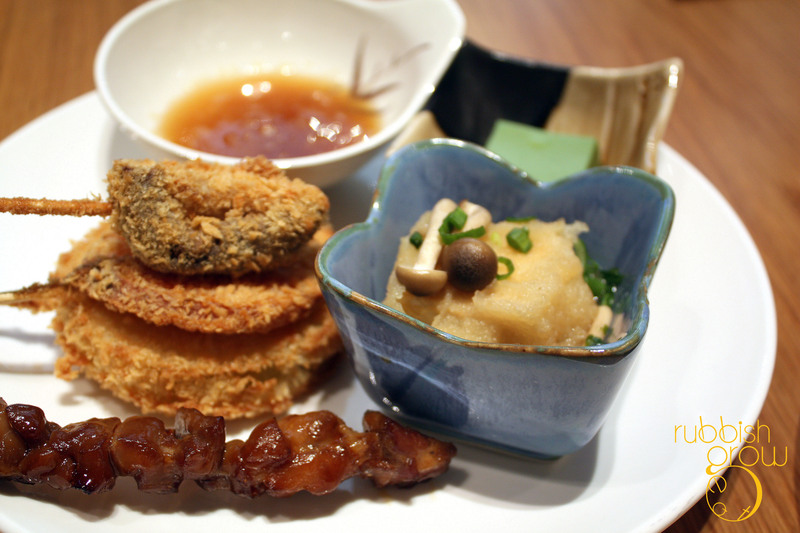 Osaka-based Chiso Zanmai buffet restaurant is here in Singapore! 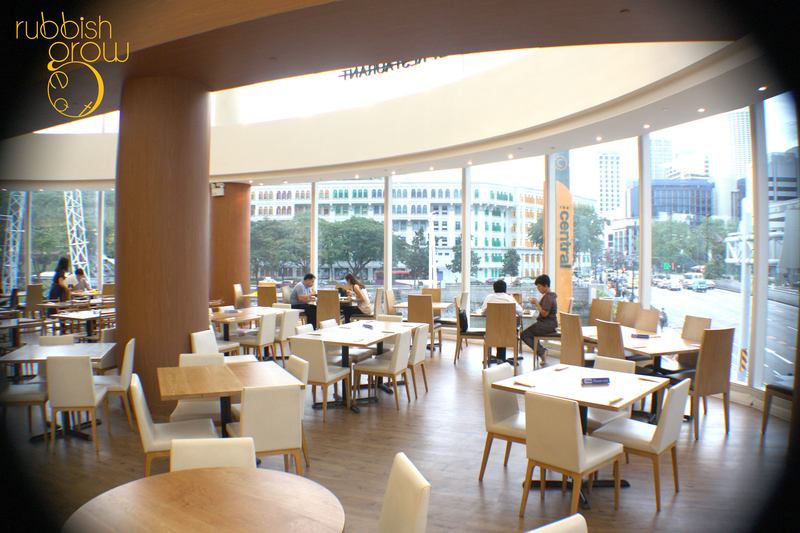 As you can see from the photo, the restaurant is huge and overlooks part of the Singapore river. Simply decorated with light wood and white chairs, it has a Japanese zen-like feel. Flown in from Asia, Australia and North America, the sashimi hasn’t many varieties, only salmon and tuna. They weren’t exceedingly fresh but they were fresh enough. The sushis weren’t well-made and the rice tended to be hard. There were some Japanese salads, which I didn’t try. The PR said the chilled lotus root was her favorite but it ran out and there wasn’t a refill. Since there were limited dishes from the cold section, I only tried the chef’s specialty, a matcha (green-tea) tofu. It was very bitter, from the green tea, and had a custard or kueh texture. I thought this would be excellent as a dessert if you drizzle condensed milk over it. The Hot Section is a smorgasbord, ranging from grilled, deep-fried, to soups. One of my favorite dishes, and one of restaurant’s specialties, is the Osaka-styled okonomiyaki or Japanese pancake crunchy with vegetable and sweet with a meat. The main difference between the Osaka-styled okonomiyaki and others is that it uses less batter/flour so it is not as heavy. It tasted light and savory. 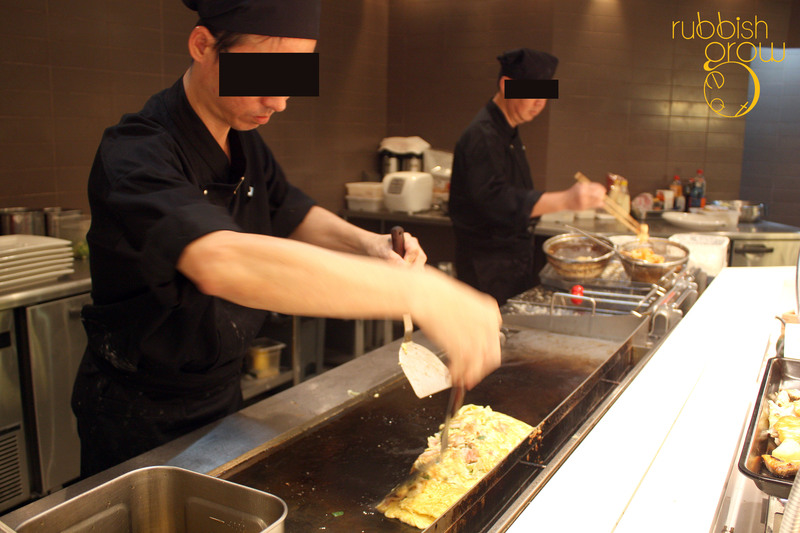 A close relative to the okonomiyaki is tonpeiyaki. The difference between them is tonpeiyaki uses no batter, only eggs, pork and cabbage. Of the two, I’d prefer okonomiyaki because it had a better mouthfeel, a nicer chew and a more complex taste. But for those on the Atkins non-carb diet, tonpeiyaki provides a good alternative. Don’t laugh when I say “diet” at a buffet ok? 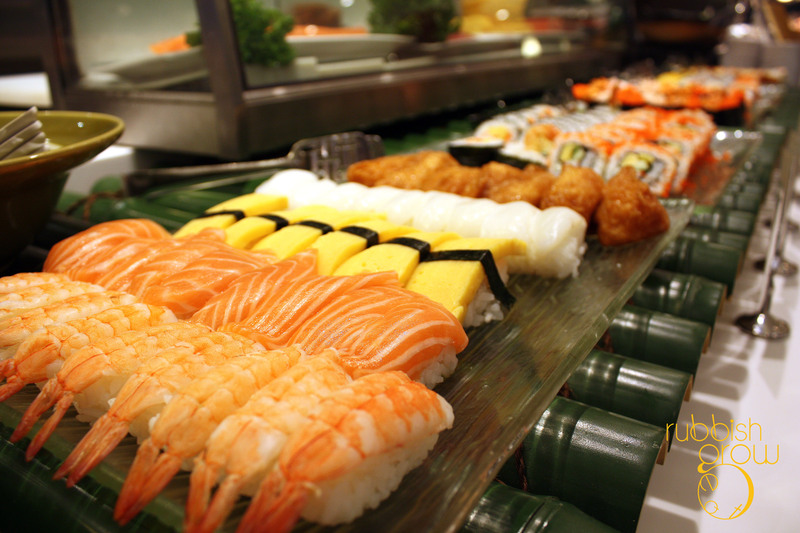 The Japanese buffet is relatively carb-free and has plenty of meat. 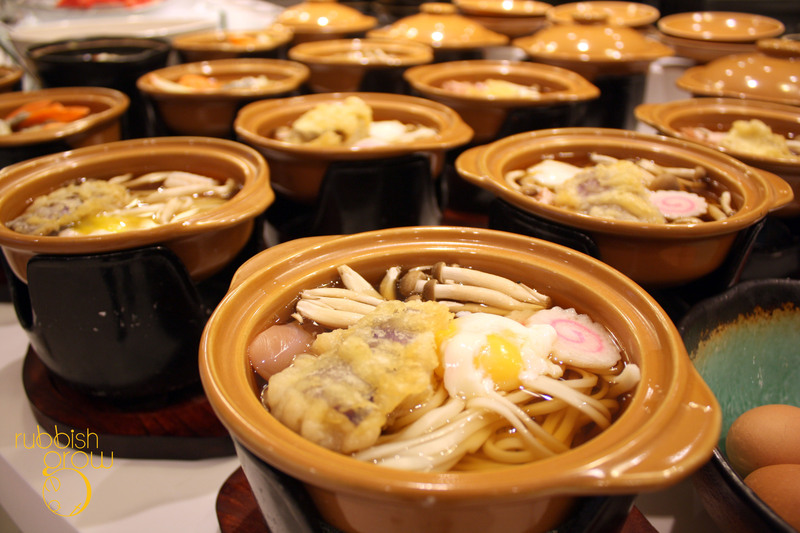 The other speciality is the hotpot with miso-based soup or with soy-sauce-based soup. It is very fun because you carry a pot, including a stove, to your table. But it takes some time for the soup to boil and by then, the noodles are soggy. The soup tasted ok, not particularly fantastic. 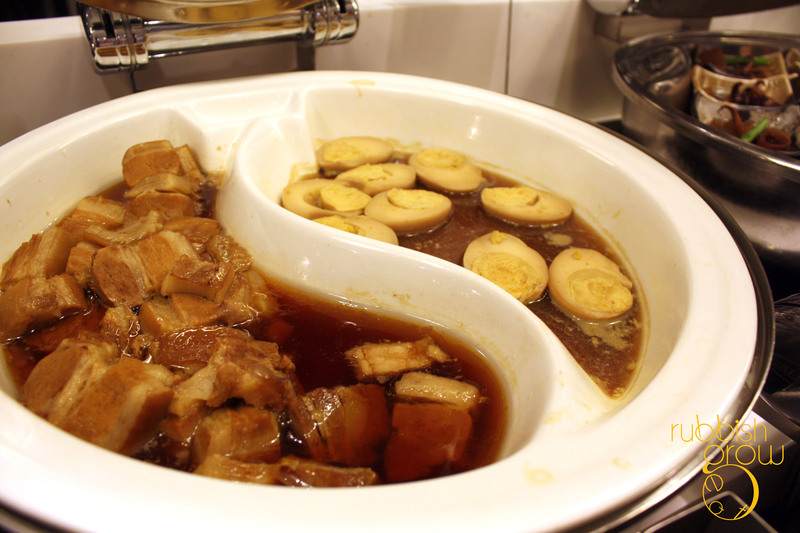 A better alternative to the hotpot were the ones that were already cooked. 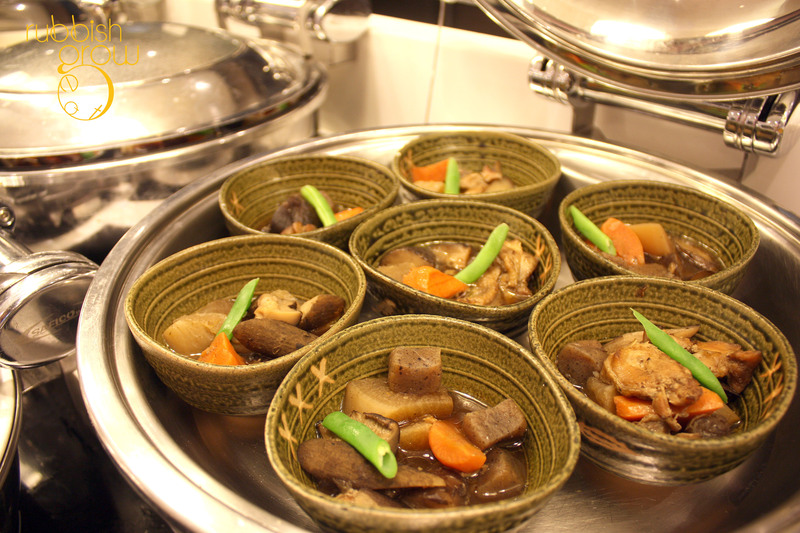 Not exactly a soup, the ingredients in the beef stew were sweet with miso. Another dish I enjoyed very much was the braised pork belly in soy and miso sauce. The favors had completely suffused into the meat, giving the meat a sweetness with a tinge of saltiness. Unlike the Singapore version of kong bak (扣肉), it was lighter and less fat, less guilty eating it. Although it was less fat, it was extremely tender and melted in the mouth. Don’t need to chew, ideal for lazy people like me. People stacked half their plates with this dish. If I were to have a top 3 recommendations, besides the okonomayaki and the braised pork, it would be the Japanese curry over rice. It was spicier and less sweet than other Japanese curries, so it was edgier. Traditionally, my favorite part of the meal: the desserts were rather limited. I ate two rounds of soft-served ice cream and on the second round, I drizzled the liquid chocolate over it. Not the smartest idea, the chocolate quickly solidified and it was hard to dig into the ice cream. 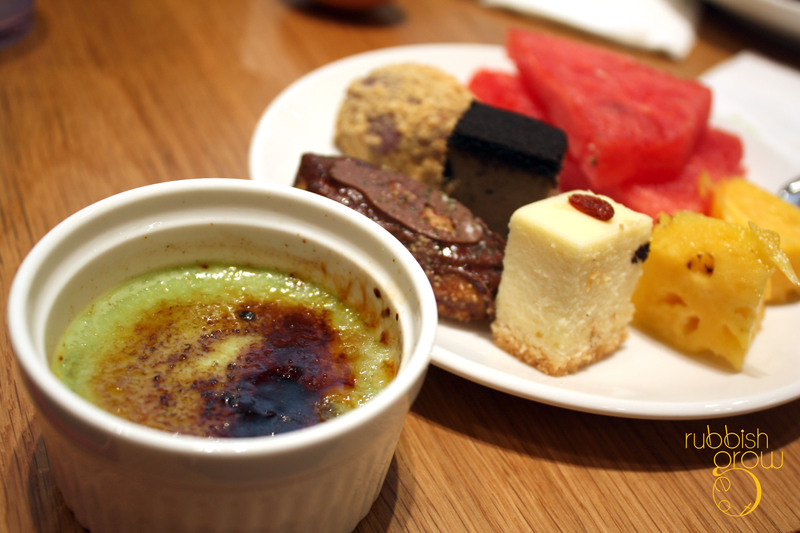 The recommended dessert was matcha creme brulee, which was disappointing because underneath the caramelized top portion was a bitter, bitter heart. Desserts have to be sweet. Another disappointment is the mochi, which came across as hard, hard as a stone, I bounced it off my plate. What I recommend is the cheesecake with a wolfberry. Very light, slightly sweet, and palatable, easy to eat. 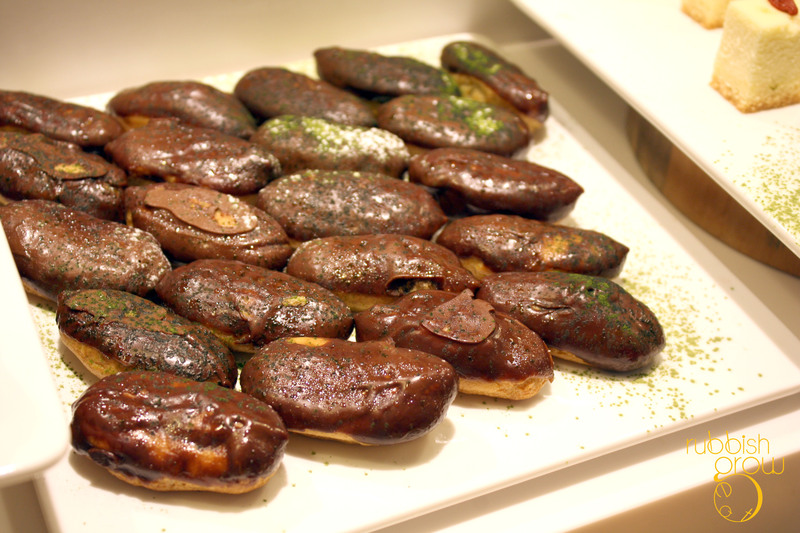 The other dessert that I really, really liked is the chocolate eclair. Every time I walked by, I just popped one into my mouth. 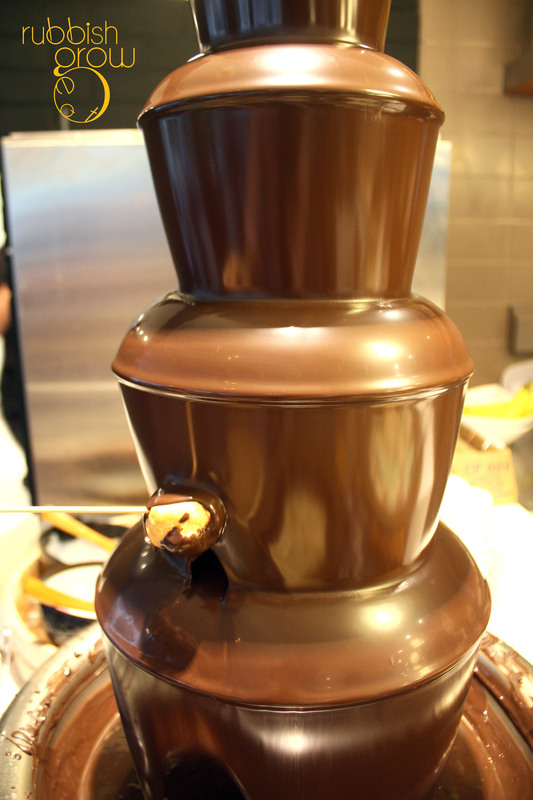 The milk chocolate within burst and flooded the senses. The flavor could need some tweaking–more intense chocolate will be nice–but the texture was pitch-perfect. There is free flow of drinks at only $1.90. They include sodas such as pepsi, 7-up, ginger ale, and non-gassy drinks such as green tea, mango juice, pineapple juice. I was quite creative in my drinks and mixed 7up and mango juice together like a mocktail. Quite fun. 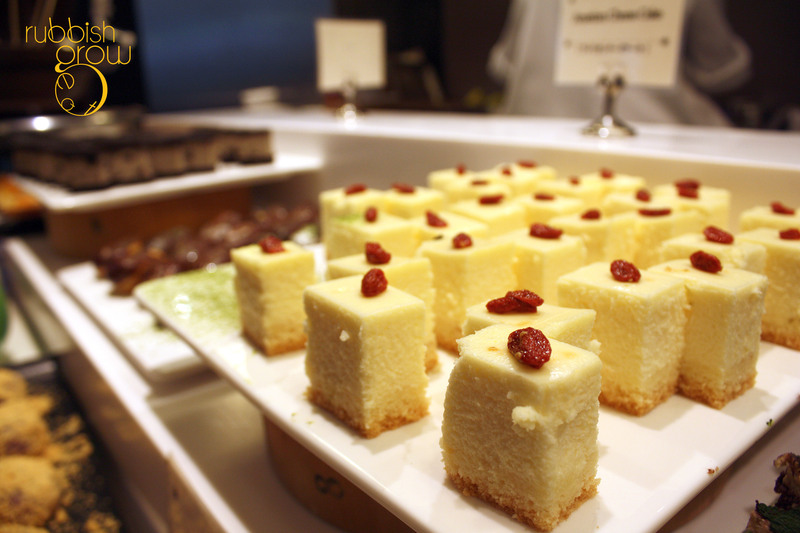 Chiso Zanmei is one of the most value-for-money buffets. Where else to find such valued buffet?! Highly recommended for students and families. PS: RERG thanks Amanda and Chiso Zanmai for the tasting. this is a new buffet restaurant? How come the layout looks exactly like Fisherman’s Marketplace which is also in the same building! Has it close down? Very astute. I think it took over Marketplace. Hi! Can u do u a review on the new private affairs? Is it opened? I went to the site it says that it will open in march but they have the menus published. I wanna eat foie gras! HI, did you go for the lunch or dinner buffet? do you know if they do serve sashimi for lunch buffets? Hi hi, we went for dinner so we don’t know if they serve sashimi for lunch. Give them a call? go weekend, they serve sashimi. Nowaday on weekday they also serve shasumi. Very average buffet, would rather pay extra $5-10 and get better experience, very disappointed. Very disappointed,Not recommend …food are cold and not fresh Stingy variety of sashimi.no going again.